thankful house: Part 2 C: Home, School or Both, Oh My! Ada currently goes to school two days a week for 6 hours each day. The other three days she's at home with me, doing school. We work for an average of 4 -5 hours each day here. This is a lot of work for me. A whole lot. I'm exhausted. But... We think it's the best thing for us, for her, for now. I want to be at home, at least a large chunk of most every day, with my little people when they're little. I have lots of reasons for this, but this little ditty I'm writing is not about stay-at-home vs working mothering. I'm going to be home with Eason and Collins, so homeschooling Ada Brooks is not taking me from something I'd otherwise be doing. I think I'm decent at it. I like to sing This Old Man, can diagram sentences (and relish it a bit much...), do math up through Cal 2 (although would like to skip geometry...), can read about any history gaps I may have (my history education was, in a word, abysmal, but that's why God made Wikipedia...and Susan Wise Bauer's Story of the World), and I love to read all types of literature and philosophy - from Amelia Bedelia to Vittgenstein. Wait, I hated that guy, but you get the point. My point is, a lot of people shouldn't homeschool either because they don't have the personalities/temperaments for it, or because, very sadly, the gaps in their own educations are big enough that a little outside help every now and then won't make up the difference: Illiterate people should not home-educate their kids. Ada is easy to teach, and she and I get along for the most part. Some kids are particularly difficult to teach - by anyone. And some just are not motivated or have some other personality clash to be educated by their parents. If it is ruining your relationship or your child isn't learning jack, home education is not for you. The schools in our area, public and private, have some pretty large problems. I know parents who successfully navigate those problems, but I also know ones who really don't. You might get a good teacher, but you might also get an awful one. They public schools are laden with not enough resources, terrifying teacher/student ratios, uninvolved parents, and a bureaucracy from hell. The private schools in our area have many of the same problems the public schools do - and while are 'better' in a lot of areas, they have the added problem of being prohibitively expensive. The school to which we would most likely want to send our kids starts at 10,000 dollars a year for kindergarten and goes up from there. Also, none of the elementary schools in a 15 mile radius from our house uses the classical method, which we really, really like. In addition both types of schools, tend to be unable/unwilling to work with children who fall out of the 'typical' expectations - who need to advance in some areas and to have extra help in certain areas. The fact is that it is rare for children to progress at the same level in all subjects - and to expect 26 of them to progress at the same time, at the same level, in all subjects is the epitome of naivete and a prime example of the assembly line gone awry. Example: Ada Brooks's handwriting is significantly behind her other subjects. This is normal, not that big of a deal, but if she's in public school, basically, she's 1 of 26 in a classroom and that means that her teacher is not going to say "oh - Ada - you are first grade age, and to stay remotely interested, you need to do third grade math, but write like a kindergartener on a good day, let's figure out how to mesh those." It ain't a gonna happen. But her mama can. I can say "Hey child of mine- Since you were bored out of your mind with the math we did last year, I'm going to get this math curriculum that is for a little bit older kids, but that means it's going to require writing of you that will frustrate you, so I'll make you a deal - if you'll have a happy attitude and you write the answers to the first half of the worksheet, you can dictate the answers to the second half and I'll write them for you." Also, schools have to give pat answers to questions from children. Early childhood is full of questions. Lots of them. All schools have indoctrination. Whoever is teaching your child at a young age will be indoctrinating him or her. It's very comforting not to have to constantly guard ourselves on all sides against things we don't believe coming from outside sources- things too liberal, things too conservative, things too anti-intellectual, things too...well...everything. Example: When Ada Brooks asks "Mama - why does this book say the world was created 6000 years ago and this one says these bones they found were from 100 million years ago?" I can actually explain what's going on there. Whereas her school teacher may be prohibited from answering (and AB may not remember to ask me later) or give an answer that is, in the best light, inadequate. As she gets older, this won't be nearly the issue that it is now, but now, it is an issue. If home is so great, why even do the two days a week thing? Isolationism - Man is not made to be alone. Or only with our families... Kids need interactions. And they need to be with folks with whom they don't share DNA. This is not the traditional 'kids need socialization' argument against homeschooling. I don't worry that Ada Brooks isn't going to become awkward and not be able to talk to people, but what I do believe is that she's not always going to only interact with people who love her and understand her. She will, in life, have to abide by people's standards outside of her own mother's, and the sooner she gets used to that, the better. Lack of accountability - you need someone, seriously, to say "Gosh - all of little Susie's peers know their multiplication tables, and little Susie doesn't - we need to do something about that..." If your child is never around other children or other educators, and thus never evaluated independently of you, you may not know if you are falling behind. Now, there are other ways than a 2 day a week school - a homeschooling mentor who will, by darn, tell you if your child is just not doing as well as she should - is a good example - or - if you are in Korea or West Texas and you cannot figure out a way to weave external accountability into your homeschool, get A Well Trained Mind - If you are keeping up with what they recommend trust me, you'll be fine. 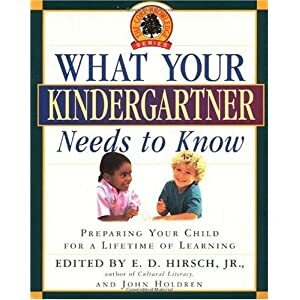 There are also these cool books called "What your (Kindergartener, First Grader, etc.) should know..." Buy them and be honest with yourself and your spouse about where your child is. Now, schools, again, tend to go too far the other way and de-personalize this. They often try to push ahead or hold back kids because they are ticking off a list of things a child should or should not know. And that's short sighted. But so is not having any standards at all. Balance. Moderation. Wisdom. Eaten up with worry (the other side of the lack-of-accountability coin)- you could be like me and need encouraging people who have experience in these areas to tell you to quit worrying that Ada Brooks's handwriting is not progressing - that it's normal. How do they know it's normal? Because they see other kids being educated.... If you go at it completely alone, well, how do you know what's normal? Now, I was so, so, so super-serious when I said for us, for her, for now. If I could, I'd add some more superlatives in there. This is not the only way to go. I have dear, dear, dear friends - in Jackson and the surrounding area - and some far away- friends who I love and, more importantly in this discussion, respect, who are currently choosing different education paths for their children. And they are doing an awesome job at it. Believe it. My way, nor any other way, is the only better way to educate. Really. Some are devotedly taking those little people to school every day, packing lunches every day (which may keep me from ever enrolling my kids full time in school), dutifully asking questions and genuinely being interested in their days, working on homework, holding the school accountable, figuring out ways to challenge/offer extra help in areas that their kids are either ahead or behind, and on and on and on. And some are at home full time with theirs - seeking out accountability and reassurance from wise, seasoned parents in their community as well as the plethora of great literature on education, avoiding crazy-land, and finding ways for their kids to get some of that good time with non-family members. Education is a means to an end. When it becomes an end in and of itself, children suffer. There are better and worse ways to educate kids - but if they are successfully being educated to be good, knowledgeable folks, then you shouldn't care how, really. You should find the best way to do that, and go for it - wholeheartedly and with much prayer and laughter. We are doing what we think is best. We could be wrong. In no other area, save perhaps religious beliefs, is charity more important. We all must work hard to quell the insecurity in our hearts and the pride in our speech.